Here comes the highly Anticipated mix of the year hosted by Ace Hypeman, Jaystar Rymz. Call him the king of New school hype & you won't be far from the truth. Party Rider as he's fondly called by fans is a multi talented hypeman with a whole different vibe and unique style. He definitely knows how to fire up the crowd and make them lose home training. 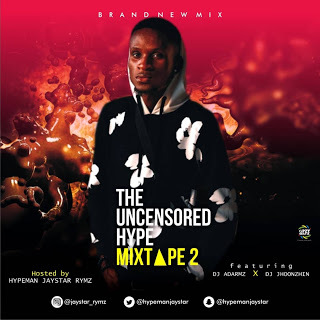 The award winning Hypeman is a graduate of Mass Communication from OOU started the trend earlier this year when he released the first Edition of his hype mix (Fusion of Hype Freestyles Recorded On DJ Mix) which went viral and was largely accepted by party audiences & music lovers. This second edition is a must have on every Playlist.. Mad vibes! This second edition features Undisputable DJ Adarmz alongside DJ Jhoonzhin.